Product #18567 | SKU 10-1251 | 0.0 (no ratings yet) Thanks for your rating! 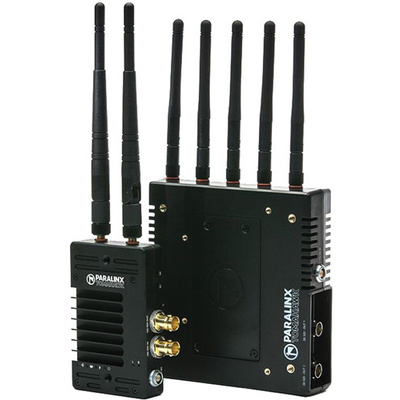 The Paralinx Tomahawk 3G-SDI 1:1 Wireless System includes one Tomahawk SDI transmitter and one receiver offering a 2000 ft(610 m) line-of-sight wireless transmission range between them. The system supports up to 1080p60 4:2:2 uncompressed video with audio across a 2000 ft (610 m) distance with less than 1 ms delay. This allows near real-time monitoring and/or recording on the output end. Longer distances can be achieved using any optional higher-range antennas with compatible RP-SMA connectors. The transmitter features a 3G-SDI input and loop output, and the receiver provides dual 3G-SDI outputs. The Tomahawk system operates on the licence-free 5 GHz frequency band and uses secure 128-bit AES encryption. The transmitter has a rugged, machined aluminium housing but also a lightweight, minimalist design that allows comfortable use on Steadicams, UAVs, and camera rigs. Its mounting points are two 1/4"-20 threads on the front, and it takes power via a 2-pin power connector input. The receiver also features a 2-pin power connector but additionally has mounting patterns for Gold-Mount male and female battery plates and V-mount male plates.